Nearly two decades after the Soviet Union's collapse -- and only months since the ascent of a Rome-friendly head of Moscow's powerful Orthodox patriarchate -- full diplomatic relations between the Holy See and Russia are becoming a reality. The announcement came earlier today at the close of a private audience between the Pope and Russian President Dimitri Medvedev, who's reportedly made firm pushes for closer ties between the Kremlin and Vatican behind the scenes at home. In the months since, the Pope quickly received Alexei's new "foreign minister," Archbishop Hilarion of Volokolamsk, and the "cultural and social questions of mutual interest" which Benedict and Medvedev talked up today -- namely, "the value of the family and the contribution believers make to life in Russia," among others -- are precisely those which the Roman and Russian pontiffs have marked out as their shared ground for closer ties. What's more, in recent days a collection of Benedict's speeches on the preeminence of Europe's Christian heritage conspicuously appeared in a Russian edition... one published by the Moscow patriarchate. 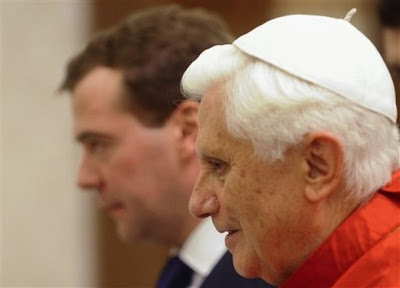 While Kirill and Benedict met on three occasions prior to his election as patriarch, the sitting heads of the Roman and Moscow churches have never come face to face. Then again, that might not be the case for much longer -- venues for the historic summit have already begun volunteering themselves.